Yom Kippur, also known as the Day of Atonement, is the holiest day of the year in Judaism. Its central themes are atonement and repentance. Jews traditionally observe this holy day with a 25-hour period of fasting and intensive prayer, often spending most of the day in synagogue services. 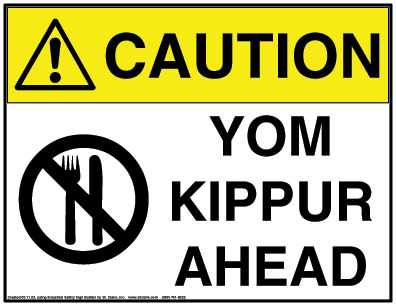 Yom Kippur completes the annual period known in Judaism as the High Holy Days or Yamim Nora’im (“Days of Awe”). GotQuestions: What is the Day of Atonement? Yom Kippur is the tenth day of the month of Tishrei (September or October). According to Jewish tradition, God inscribes each person’s fate for the coming year into a book, the Book of Life, on Rosh Hashanah, and waits until Yom Kippur to “seal” the verdict. During the Days of Awe, adherents to Judaism try to amend his or her behavior and seek forgiveness for wrongs done against God and against other human beings. The evening and day of Yom Kippur are set aside for public and private petitions and confessions of guilt. At the end of Yom Kippur, one considers themselves absolved by God. There are five afflictions associated with observance of Yom Kippur. The Seder Moed states that the following abstentions (deliberate self-denials) meet the requirements for Yom Kippur. On this day the high priest (Kohen Gadol) makes sacrifice for his own sin and the sins of the people. He reconsecrates the entire tent of meeting and its surrounds for the worship and service of God. This is the only day of the year that the high priest is allowed to enter the Most Holy Place and sprinkle blood for the atonement of sin. The ceremony is described in the sixteenth chapter of the Book of Leviticus. The LORD spoke to Moses after the death of the two sons of Aaron, when they drew near before the LORD and died, and the LORD said to Moses, “Tell Aaron your brother not to come at any time into the Holy Place inside the veil, before the mercy seat that is on the ark, so that he may not die. For I will appear in the cloud over the mercy seat. But in this way Aaron shall come into the Holy Place: with a bull from the herd for a sin offering and a ram for a burnt offering. He shall put on the holy linen coat and shall have the linen undergarment on his body, and he shall tie the linen sash around his waist, and wear the linen turban; these are the holy garments. He shall bathe his body in water and then put them on. And he shall take from the congregation of the people of Israel two male goats for a sin offering, and one ram for a burnt offering. Aaron shall offer the bull as a sin offering for himself and shall make atonement for himself and for his house. Then he shall take the two goats and set them before the LORD at the entrance of the tent of meeting. And Aaron shall cast lots over the two goats, one lot for the LORD and the other lot for Azazel. And Aaron shall present the goat on which the lot fell for the LORD and use it as a sin offering, but the goat on which the lot fell for Azazel shall be presented alive before the LORD to make atonement over it, that it may be sent away into the wilderness to Azazel. Aaron shall present the bull as a sin offering for himself, and shall make atonement for himself and for his house. He shall kill the bull as a sin offering for himself. And he shall take a censer full of coals of fire from the altar before the LORD, and two handfuls of sweet incense beaten small, and he shall bring it inside the veil and put the incense on the fire before the LORD, that the cloud of the incense may cover the mercy seat that is over the testimony, so that he does not die. And he shall take some of the blood of the bull and sprinkle it with his finger on the front of the mercy seat on the east side, and in front of the mercy seat he shall sprinkle some of the blood with his finger seven times. Then he shall kill the goat of the sin offering that is for the people and bring its blood inside the veil and do with its blood as he did with the blood of the bull, sprinkling it over the mercy seat and in front of the mercy seat. Thus he shall make atonement for the Holy Place, because of the uncleannesses of the people of Israel and because of their transgressions, all their sins. And so he shall do for the tent of meeting, which dwells with them in the midst of their uncleannesses. No one may be in the tent of meeting from the time he enters to make atonement in the Holy Place until he comes out and has made atonement for himself and for his house and for all the assembly of Israel. Then he shall go out to the altar that is before the LORD and make atonement for it, and shall take some of the blood of the bull and some of the blood of the goat, and put it on the horns of the altar all around. And he shall sprinkle some of the blood on it with his finger seven times, and cleanse it and consecrate it from the uncleannesses of the people of Israel. And when he has made an end of atoning for the Holy Place and the tent of meeting and the altar, he shall present the live goat. And Aaron shall lay both his hands on the head of the live goat, and confess over it all the iniquities of the people of Israel, and all their transgressions, all their sins. And he shall put them on the head of the goat and send it away into the wilderness by the hand of a man who is in readiness. The goat shall bear all their iniquities on itself to a remote area, and he shall let the goat go free in the wilderness. Then Aaron shall come into the tent of meeting and shall take off the linen garments that he put on when he went into the Holy Place and shall leave them there. And he shall bathe his body in water in a holy place and put on his garments and come out and offer his burnt offering and the burnt offering of the people and make atonement for himself and for the people. And the fat of the sin offering he shall burn on the altar. And he who lets the goat go to Azazel shall wash his clothes and bathe his body in water, and afterward he may come into the camp. And the bull for the sin offering and the goat for the sin offering, whose blood was brought in to make atonement in the Holy Place, shall be carried outside the camp. Their skin and their flesh and their dung shall be burned up with fire. And he who burns them shall wash his clothes and bathe his body in water, and afterward he may come into the camp. And it shall be a statute to you forever that in the seventh month, on the tenth day of the month, you shall afflict yourselves and shall do no work, either the native or the stranger who sojourns among you. For on this day shall atonement be made for you to cleanse you. You shall be clean before the LORD from all your sins. It is a Sabbath of solemn rest to you, and you shall afflict yourselves; it is a statute forever. And the priest who is anointed and consecrated as priest in his father’s place shall make atonement, wearing the holy linen garments. He shall make atonement for the holy sanctuary, and he shall make atonement for the tent of meeting and for the altar, and he shall make atonement for the priests and for all the people of the assembly. And this shall be a statute forever for you, that atonement may be made for the people of Israel once in the year because of all their sins.” And Moses did as the LORD commanded him. GotQuestions: What is the Meaning of Azazel / the Scapegoat? God’s repeated instruction to the people is that they are to deny themselves. They must abstain from food and other pleasures, to fast in sorrow for their sins. This is not a time for joyful celebration, but for deep repentance and solemn sacrifice. The following summary of the Temple service is based on the traditional Jewish religious account described in rabbinical writings, appearing in contemporary traditional Jewish prayer books for Yom Kippur, and studied as part of a traditional Jewish Yom Kippur worship service. While the Temple in Jerusalem was standing (from Biblical times through 70 C.E. ), the Kohen Gadol was mandated by the Torah to perform a complex set of special services and sacrifices for Yom Kippur to attain Divine atonement, the word “kippur” meaning “atone” in Hebrew. These services were considered to be the most important parts of Yom Kippur because through them the Kohen Gadol made atonement for all Jews and the world. During the service, the Kohen Gadol entered the Holy of Holies in the center of the Temple, the only time of the year that anyone went inside. Doing so required special purification and preparation, including five immersions in a mikvah (ritual bath), and four changes of clothing. The Kohen Gadol first performed the regular daily (tamid) offering — usually performed by ordinary priests — in special golden garments, after immersing in a mikvah and washing his hands and feet. The Kohen Gadol immersed in a special mikvah in the Temple courtyard and changed into special linen garments, and washed his hands and feet twice, once after removing the golden garments and once before putting on the linen garments. The Kohen Gadol leaned (performed Semikha) and made a confession over the bull on behalf of himself and his household, pronouncing the Tetragrammaton. The people prostrated themselves when they heard this. He then slaughtered the bull as a chatat (sin-offering) and received its blood in a bowl. The Kohen Gadol ascended the mizbeach (altar) and took a shovel full of embers with a special shovel. He was brought incense. He filled his hands and placed it in a vessel. (The Talmud considered this the most physically difficult part of the service, as the Kohen Gadol had to keep the shovelful of glowing coals balanced and prevent its contents from dropping, using his armpit or teeth, while filling his hands with the incense). Holding the shovel and the vessel, he entered the Kadosh Hakadashim, the Temple’s Holy of Holies. In the days of the First Temple, he placed the shovel between the poles of the Ark of the Covenant. In the days of the Second Temple, he put the shovel where the Ark would have been. He waited until the chamber filled with smoke and left. The Kohen Gadol took the bowl with the bull’s blood and entered the Most Holy Place again. He sprinkled the bull’s blood with his finger eight times, before the Ark in the days of the First Temple, where it would have been in the days of the Second Temple. The Kohen Gadol then left the Holy of Holies, putting the bowl on a stand in front of the Parochet (curtain separating the Holy from the Holy of Holies). The Kohen Gadol went to the eastern end of the Israelite courtyard near the Nikanor Gate, laid his hands (semikha) on the goat “for the Lord,” and pronounced confession on behalf of the Kohanim (priests). The people prostrated themselves when he pronounced the Tetragrammaton. He then slaughtered the goat, and received its blood in another bowl. The Kohen Gadol took the bowl with the goat’s blood and entered the Kadosh Hakadashim, the Temple’s Holy of Holies again. He sprinkled the goat’s blood with his finger eight times the same way he had sprinkled the bull’s blood. The blood was sprinkled before the Ark in the days of the First Temple, where it would have been in the days of the Second Temple. The Kohen Gadol then left the Kadosh Hakadashim, putting the bowl on a stand in front of the Parochet (curtain separating the Holy from the Holy of Holies). Standing in the Hekhal (Holy), on the other side of the Parochet from the Holy of Holies, the Kohen Gadol took the bull’s blood from the stand and sprinkled it with his finger eight times in the direction of the Parochet. He then took the bowl with the goat’s blood and sprinkled it eight times in the same manner, putting it back on the stand. The Kohen Gadol removed the goat’s blood from the stand and mixed it with the bull’s blood. Starting at the northeast corner, he then smeared the mixture of blood on each of the four corners of the Golden (Incense) altar in the Haichal. He then sprinkled the blood eight times on the altar. The Kohen Gadol left the Haichal and walked to the east side of the Azarah (Israelite courtyard). Near the Nikanor Gate, he leaned his hands (Semikha) on the goat “for Azazel” and confessed the sins of the entire people of Israel. The people prostrated themselves when he pronounced the Tetragrammaton. While he made a general confession, individuals in the crowd at the Temple would confess privately. The Kohen Gadol then sent the goat off “to the wilderness.” In practice, to prevent its return to human habitation, the goat was led to a cliff outside Jerusalem and pushed off its edge. While the goat “for Azazel” was being led to the cliff, the Kohen Gadol removed the insides of the bull, and intertwined the bodies of the bull and goat. Other people took the bodies to the Beit HaDeshen (place of the ashes). They were burned there after it was confirmed that the goat “for Azazel” had reached the wilderness. After it was confirmed that the goat “for Azazel” had been pushed off the cliff, the Kohen Gadol passed through the Nikanor Gate into the Ezrat Nashim (Women’s Courtyard) and read sections of the Torah describing Yom Kippur and its sacrifices. The Kohen Gadol removed his linen garments, immersed in the mikvah in the Temple courtyard, and changed into a second set of special golden garments. He washed his hands and feet both before removing the linen garments and after putting on the golden ones. The Kohen Gadol offered two rams as an olah offering, slaughtering them on the north side of the mizbeach (outer altar), receiving their blood in a bowl, carrying the bowl to the outer altar, and dashing the blood on the northeast and southwest corners of the Outer Altar. He dismembered the rams and burned the parts entirely on the outer altar. He then offered the accompanying mincha (grain) offerings and nesachim (wine-libations). The Kohen Gadol then offered the Musaf offering. The Kohen Gadol placed the insides of the bull and goat on the outer altar and burned them entirely. The Kohen Gadol removed his golden garments, immersed in the mikvah, and changed to a new set of linen garments, again washing his hands and feet twice. The Kohen Gadol returned to the Holy of Holies and removed the bowl of incense and the shovel. The Kohen Gadol removed his linen garments, immersed in the mikvah, and changed into a third set of golden garments, again washing his hands and feet twice. The Kohen Gadol completed the afternoon portion of the regular (tamid) daily offering in the special golden garments. He washed his hands and feet a tenth time. The Kohen Gadol wore five sets of garments (three golden and two white linen), immersed in the mikvah five times, and washed his hands and feet ten times. Sacrifices included two (daily) lambs, one bull, two goats, and two rams, with accompanying mincha (grain) offerings, wine libations, and three incense offerings (the regular two daily and an additional one for Yom Kippur). The Kohen Gadol entered the Holy of Holies three times. The Tetragrammaton was pronounced three times, once for each confession. Most Christians disregard the feasts and celebrations of the Tanakh (Old Testament). They do this because they have been mislead to believe that these Holy Days are irrelevant or insignificant in some way. Paul the Apostle wrote that these feasts and celebrations were a shadow (type/antitype) of the things to come through Jesus Christ. The Day of Atonement has deep theological significance in the New Testament (B’rit Chadashah). Chapters 8 to 10 of the Epistle to the Hebrews argue that it pointed forward to the work of Jesus Christ (Yeshua HaMashiach) as our High Priest. These preparations having thus been made, the priests go regularly into the first section, performing their ritual duties, but into the second only the high priest goes, and he but once a year, and not without taking blood, which he offers for himself and for the unintentional sins of the people. By this the Holy Spirit indicates that the way into the holy places is not yet opened as long as the first section is still standing (which is symbolic for the present age). According to this arrangement, gifts and sacrifices are offered that cannot perfect the conscience of the worshiper, but deal only with food and drink and various washings, regulations for the body imposed until the time of reformation. But when Christ appeared as a high priest of the good things that have come, then through the greater and more perfect tent (not made with hands, that is, not of this creation) he entered once for all into the holy places, not by means of the blood of goats and calves but by means of his own blood, thus securing an eternal redemption. For if the blood of goats and bulls, and the sprinkling of defiled persons with the ashes of a heifer, sanctify for the purification of the flesh, how much more will the blood of Christ, who through the eternal Spirit offered himself without blemish to God, purify our conscience from dead works to serve the living God. Therefore he is the mediator of a new covenant, so that those who are called may receive the promised eternal inheritance, since a death has occurred that redeems them from the transgressions committed under the first covenant. Isaiah the Prophet wrote, “Come now, let us reason together, says the LORD: though your sins are like scarlet, they shall be as white as snow; though they are red like crimson, they shall become like wool” (Isaiah 1:18 ESV). Many Christians are not aware of the significance of this passage. During the time of the Second Temple, a strip of wool would be dipped into the blood of the sin offering which had been sacrificed. This wool was cut into two pieces, one was kept in Jerusalem at the Second Temple, and the other was tied to the horns of the goat for Azazel. When the strip of wool that was in Jerusalem turned white, the High Priest knew that the sacrifice was accepted by God for the atonement (covering) of the sins of the people. Chapters 8 to 10 of the Epistle to the Hebrews also clearly explains how Jesus Christ became our High Priest and entered heaven (the Holy of Holies), once and for all, not by the blood of sacrificial animals, but by his own precious blood on the cross at Calvary. Christ (Messiah) Himself was the atoning sacrifice for our sins; thus, he obtained for us eternal redemption, All believers accept the sacrifice of Jesus Christ as the fulfillment of Yom Kippur, the final atonement for sin. The Day of Atonement is significant for Christians. It pictures Christ’s sacrifice for our sins and that Satan has a role and will be sent away (and bound for the millennium). While many Christians somewhat understand this, because they do not keep this and the other Holy Days, they often do not have a proper view of God’s entire plan of salvation, such as the role of Satan and Christ. This Day of Atonement provides a type/antitype not only what has happened (with Christ) but some of what will happen with Satan (while the holy days that follow show other events that will happen later). This is information that Christians living in these latter days should value. I recommend Passion for Truth Ministries‘ video by Jim Staley, God’s Prophetic Calendar: Yom Kippur for additional studies on the Day of Atonement.